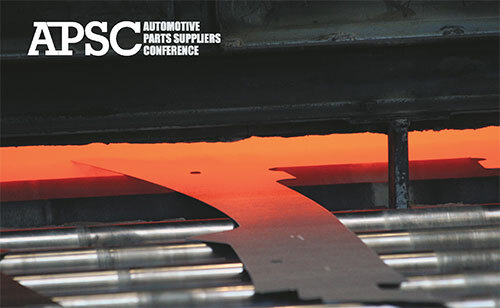 Steel blanks enter a furnace in the first stage of the hot-stamping process. Heating the blanks to above 900 C makes them more malleable while shifting the steel to a full austenitic phase. Developed in the early-1970s and first used to provide wear resistance for knives, lawn-mower blades and shovels, press hardening—or hot stamping—was conceived as a means to replace cold stamping and secondary batch hardening with a forming/quenching process within a single tool. Today, hot stamping finds itself in the midst of a renaissance, owing to automotive lightweighting and safety trends. Thanks to decades of R&D, hot stamping has undergone generational technology changes that now enable it to serve as a viable process for production of front and rear crash-zone parts, well past its early automotive applications for impact beams and pillars. Key is the ability to create ever more specific soft zones in the parts, according to Paul Belanger, director of Gestamp R&D North America. 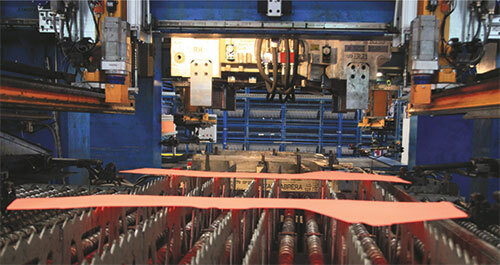 To retain heat, the blanks quickly route to the press, and specially built dies, for forming and quenching. Hot stamping enables higher-strength steels to be formed into complex shapes more efficiently than via traditional cold stamping. Basically, steel blanks are fed into tunnel or stacked furnaces and heated to a temperature (above 900 C) that makes the blanks malleable. Blanks move into the press, typically a hydraulic model due to the need to control stroke rate and enable dwell time, for forming, followed immediately by in-die quenching for 3 to 10 sec. ; in-die water channels serve this purpose. The heating and quenching processes—the former shifting the steel to a full austenitic phase followed by the latter for transformation to a full martensitic phase—create the hardened material while not overly stressing the tooling, thus the material can be formed more easily prior to reaching its final hardened state. Via this process, ultra-hard steel is formed into complex shapes, resulting in lightweight yet strong parts that, otherwise, typically would require thicker, heavier cold-stamped parts welded together. By using improved validation measures such as advanced forming and crash simulation data and software, Honda and Gestamp were able to better localize soft zones in the die during hot stamping, resulting in production of rear rails in the 2015 Honda Civic with soft-zone features that enable improved impact-energy absorption in the event of a crash. The development earned Honda and Gestamp the Steel Market Development Institute’s Automotive Excellence Award in 2016. Gestamp, for its part, has been hot stamping from its earliest use in Europe, and now is exploring the use of lasers to create soft zones immediately following the stamping process. 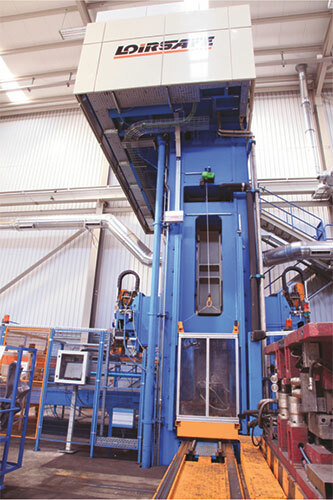 A hydraulic press is specified for hot-forming operations due to precise control of stroke speed and increased dwell time. For in-die quenching, dies include channels through which water flows to quickly cool parts. This action transforms the steel to a martensitic phase, a process that hardens the material. By routing the channels in certain ways, specified areas of the part can be bypassed for quenching. These areas become soft zones. Today, soft zones can be placed in general areas of a part within the die by modifying the route of cooling water during quenching, with less-cooled sections becoming the soft zones. By leveraging advancements in simulation software and improved crash-test data, Gestamp has been working with lasers to better localize softness in what Belanger calls the fourth generation of hot-stamping evolution. “Lasers soften the hot-stamped part very selectively, expanding the areas that can be softened and doing so in complex geometries to make the parts behave more specifically in a crash,” he explains. Achieving such selective soft zones arises from Gestamp’s validation efforts, according to Belanger. There are a few ways to configure a hot-stamping/laser operation, offers Belanger, noting that laser softening can work with a laser cutter because, for the most part, hot-stamped parts undergo post-forming laser trimming. One option: a cell configuration with a two-way table, where a post-formed part rotates into a laser-cutting operation for softening and cutting. Another: a three-way table, with the loaded part rotated into separate laser-based cutting and softening operations. “We feel that hot stamping plus laser softening is limited to low-volume production, but eventually it will handle typical automotive volumes,” says Belanger. “That will require capital investment, such as changing a laser-cutting cell to a three-station footprint. The key to productivity is to make sure that the cycle times for laser softening are not significantly greater than the cycle times for cutting. Gestamp is progressing in R&D efforts related to what it calls Flex Laser Softzone technology. The company is continuing to industrialize the technology and is working with its OEM customers on a variety of parts, ranging from pillars to rails, and on a variety of future vehicles with volumes ranging from niche-vehicle volumes to vehicles with high-volume production. Belanger sees promise for the technology not only in improving vehicle crash performance by controlling the kinematics during deformation, but also in improving deformation in resistance-spot-welded joints by increasing the ductility in the parent metal adjacent to the spot weld. This increases the overall loading capability of the joint, Belanger explains. The technology also offers another possibility: “Enable mechanical joining of alternative materials such as aluminum or carbon-fiber-reinforced polymers into ultra-high-strength hot-stamped steel by selectively softening flanges to achieve robust clinching and/or riveting,” he says.